Watch the video below. The guy makes some alarming and stunning claims. If they are true, we are truly doomed. I suspect we might yet be in good hands. Once upon a time and many years ago, I served in the Australian Army for many, many years. Most people know that ‘military time’ is read using a 24-hour clock. That is to say that 8.30 pm would be read ‘2030 hours’. During my time in the Army when I was a young gunnery officer, there was a gathering we used to have when young gunnery officers on course at the old School of Artillery. Come 10 pm, we would drop our studies and meet in the bar for a few drinks and to share a laugh with a bit of a ribbing. Recently, I had suggested that we could reconvene the 10 o’clock Club on Twitter by posting what we were doing and where we were at on that evening at 10 pm as if gathering for the 10 o’clock Club. It worked to some degree, although with less pick-up than might be seen as successful. Now, with the change of this new agenda for a global partnership, or the imminent rise of a New World Order depending on your worldview, it is appropriate that the 10 o’clock Club should also reflect this change. Consequently, I’m inviting you all to the 2030 Agenda every evening at 8.30 pm. Post every evening with something that comes as close to addressing the issue of child survival with the #2030Agenda. I will be posting every evening (as often as I can) at 8.30 pm on Twitter (in whatever time zone I am in). I hope to see you at the #2030Agenda soon! This entry was posted in 2030 Agenda, Sustainable Development Goals, United Nations and tagged 2030 Agenda, Child survival, Illuminati, New World Order, Poverty, Sustainable Development Goals, United Nations. The G20 has been widely criticised in past years as being all talk and no action. When first framing the 10 City Bridge Run ahead of the Seoul G20 Summit in 2010, I asked “Will the G20 cut it?” at this link. Development remains a key element of the Group of Twenty (G20) agenda. I sense that the G20 recognises both its ability and limitation to influence development through strengthening economic growth and resilience. This is at the heart of economic thought: how to best allocate the distribution of scarce resources. Raising global growth to deliver better living standards and quality jobs for people across the world is our highest priority. Secondly, the Summit is to some extent a forum of theatrics. It is misleading to think the G20 Summit as a dynamic roundtable to discuss all of the issues in detail. There is a lot of preliminary and behind-the-scenes discussions and negotiations that take place outside of the limelight to resolve how members of the G20 will orientate their national interest with the agenda for the Summit. It is more than a photo opportunity, and such gatherings are important. Theatrics serve a purpose, and they also signal what people are keenly focused on. In focusing on one thing, they also steal a lot of the oxygen out of the occasion to more freely discuss a broader range of issues. 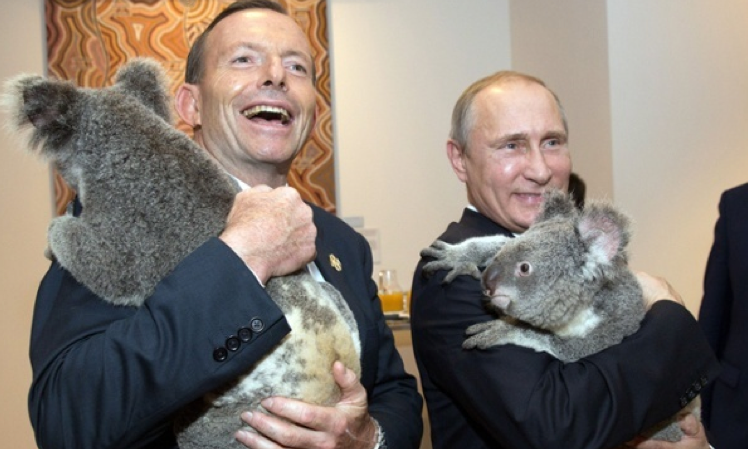 In Brisbane, the theatrics was mainly seen through the grandstanding of and by Putin around the Ukraine incident. That is signalling how the Ukraine is fast becoming a place of heightened strategic value for leaders to communicate their sovereign will and power. The consequences of this grandstanding will not be immediately clear, but ripple through events that are yet to unfold. Consequences are important, and the issue that receives the limelight will be at the expense of others that do not get discussed in depth. Obama flagged his theatrics publicly at a university address prior to the G20 to gain most favourable media attention to help sway his agenda. Thirdly, wording is important and will ultimately drive action. The concluding G20 Leaders’ Communique and supporting documents give guidance for the future. If an issue doesn’t make the list, that would be troubling for those who see it as important. The question becomes one of what concrete and practical action will actually trickle down from this wording? Our work has continued to contribute to the achievement of the Millennium Development Goals. Further, we reaffirmed our strong support for the ongoing intergovernmental efforts in the UN to conclude an inclusive and people-centred post-2015 development agenda and for its effective implementation. We reaffirmed the commitment of the international community to poverty eradication and a coherent approach to sustainable development, which integrates its three dimensions in a balanced manner. We underlined the central imperative of poverty eradication and are committed to freeing humanity from poverty and hunger as a matter of urgency. We look forward to the third Financing for Development Conference to be held in Addis Ababa in July 2015. We reaffirmed our commitment to ensure that G20 activities beyond 2015 are coherent with the post 2015 development agenda. The wording from the G20 Leaders’ Communique shows that this responsibility is one that is for the United Nations to resolve, but one which has the support of the G20 for an ambitious post-2015 agenda: We support efforts in the United Nations to agree an ambitious post-2015 development agenda. The question of how an issue will strengthen economic growth and resilience is important to address to receive more attention. We, the Leaders of the G20, are united in our conviction that by working together we can secure a more prosperous future for the citizens of all countries… The Seoul Consensus complements our commitment to achieve the Millennium Development Goals (MDGs) and focuses on concrete measures … to make a tangible and significant difference in people’s lives. There is consistency between what was written in 2010 and most recently in Brisbane yesterday. This is comforting to know, and no small measure for optimism as we look to address child survival in the context of economic growth and resilience. Recent statements from Australia’s Foreign Minister Julie Bishop about embracing a new paradigm of development assistance through looking for innovative ideas is consistent with this as well to build concrete measures to make a tangible and significant difference in people’s lives through improving child survival. 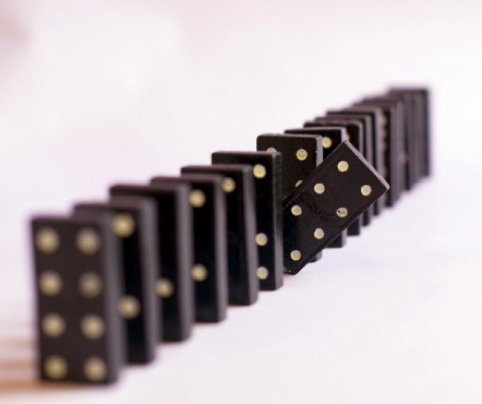 The case for taking action is an ethical issue. It is a good thing to do and the right thing to do, as well as being just. It doesn’t need the imprimatur of the G20 to take action. As global citizens, the outcome from the G20 Summit in Brisbane indicates that the institution is something to be readily engaged with on this issue because we both share a common objective. Opening the conversation with countries from the G20 is an important step towards the Design Forum in 2015. This entry was posted in Design Forum, G20, Millennium Development Goals, United Nations and tagged Brisbane, Design Forum, G20 Summit, Millennium Development Goals, United Nations. The United Nations General Assembly is meeting again this year, this week. The agenda, as usual, is full and widely ranging. Anyone who has ever worked for the United Nations can attest to a shared sense of frustration and optimism about what outcomes might be realised. Success or failure? Dysfunction and broken beyond repair, or best available outcome with seeking consensus among such a disparate collection of global citizens? The answer to these questions will never be settled, but one thing is for sure is the massive convening power that the United Nations has brought since its inception many years ago on 24 October following the end of the Second World War. The Millennium Development Goals are an aspirational list of eight objectives unanimously agreed upon by all member states in 2000 to reduce 1990 levels of poverty by two-thirds before 2015. The deadline is next year, and the writing is already on the wall in terms of success that has been achieved. The result is more than simply a pass/fail scorecard. The goals were always aspirational in nature, but within reach. One of those goals, Goal 4: Reduce Child Mortality, is the key focus on the 10 City Bridge Run. In many cases, there are great stories of progress and success, but the distribution of this is unequally experienced. The results in some countries remains troubling. Papua New Guinea is one country which is unlikely to meet its stated objectives. Other countries remain at high levels of poverty, despite being extremely rich in minerals. Sierra Leone has the highest rate of child mortality, but is the biggest producer of diamonds in the world. How can this be? It doesn’t seem to make sense. My friend Edison, who was a journalist from Sierra Leone, and spent time in jail for his political views, has spent a little bit of time telling me about the background to conflict in the country, and helping me to try to understand why problems there should be so bad. What was the cause of so much ill-health and poverty, I wondered? Now, also with Ebola to contend with. The same answer is true to for child mortality. If that is the case, then how to improve the delivery of child survival? This is a question we are hoping to contend with across the next couple of months. Meanwhile, the United Nations are discussing the Post 2015 Development Framework. This doesn’t change the fact that child mortality is a problem. Why does it matter how things are measured beyond 2015? Why not just keep the old MDG and push a little harder? “United Nations is preparing a new sustainable development framework with its member states as the Millennium Development Goal (MDGs) will get end in 2015. Speakers also urged to adopt a strong, inclusive and legitimate Post 2015 framework to success the Millennium Development Goals.” But what does this actually mean, or is it just a room full of well-dressed bureaucrats word-smithing a strategic document? It does matter, and it is not just a word game. The outcome will need to be focused on rights, transparency, addressing corruption, and a framework that is grounded in sustainability. The question will be whether countries will use their diplomatic jockeying for other issues of a security nature to influence or block resolve and consensus for a strong and cohesive result. It might sound like a lot of hot air, but these will be a guiding strategic tool for the next couple of decades. The work in New York this week is important, make no mistake. To give an insight into the complexity, here is the extract from a recent press release. You can see from reading this, that the simplicity of eight MDG was remarkable when now looking at the intricacies of competing ethical concerns. All are important, but if it has everything it risks being meaningless, and if it is reduced to a couple of bullet-points, it risks being toothless. “The post 2015 framework must reinforce international human rights commitments, laws and standards, fight injustice and address how its goals will allow for a progressive realization of rights. It must embrace a rights-based approach to development based on equality, equity and non-discrimination, and ensure the rights of people to participate fully in society and in decision-making, Ahmed Swapan emphasized. Ahmed Swapan also said that developed countries must comply with their commitment to provide 0.7 per cent of their gross national product (GNP) and the unfinished business and they should align and harmonize their activities to avoid competitions and to be refraining from service overlapping. There should also be more transparency and accountability in delivering services to the communities for whom development is meant. Pratima Paul Majumder said that United Nations must emphasize women rights in the Post 2015 development framework. She also demanded that government should include gender equality and women rights as priority area in new framework. The post 2015 framework must recognize the global resource constraints and aim at a more equitable distribution of resources, including how it meets the rights and needs of future and present generations. She urged to ensure decent work environment and living wages for the women labour. She questioned the present mode of corporate based development which is unfavorable for realization of women rights. This model has particularly worsen life and livelihood of rural, indigenous and migrant women. The Post-2015 framework must be underpinned by the strongest, most robust and comprehensive accountability framework possible, incorporating the commitment to monitor and report on progress and share learning and knowledge. This entry was posted in Millennium Development Goals, Post 2015 Development Framework, United Nations and tagged 10 City Bridge Run, Millennium Development Goals, Post 2015 Development Framework, Sustainability. A few short months after the conclusion of the Second World War, the United Nations was formed on 24 October, the anniversary of today. Do anniversaries really mean anything to anyone anymore? What about the United Nations? A colossal failure and bureaucratic mess? Or is it a critical international place of important convening? I have had my own first hand experience working with the United Nations in many different capacities, but perhaps most significantly was as the Lead Operations and Plans Officer for the Australian Defence Force while deployed into East Timor. Certainly, it is not a perfect organisation, but would the world be better off without it? I think not. Far beyond an instrument of global security, the United Nations focuses across a broad range touching every aspect of the human experience. The one area this blog focuses on is the eight Millennium Development Goals signed by all 192 Member States in 2000 to reduce extreme poverty levels to two-thirds of the recorded levels in 1990 by 2015. It has been one area where there has been some success. It is not a perfect story: child mortality remains improved, but only reduced to half of the recorded levels of 1990, and so the aspiration to achieve a two-thirds reduction by 2015 might be unobtainable. Work remains to be done. And it is not for us to sit back and criticise the United Nations. We must put our shoulder to the wheel also. We continue to show what collective action can do. We can do even more. In a world that is more connected, we must be more united. This is the sentiment of the 10 City Bridge Run. To build a human bridge between ourselves to help address the problems we face. Together we can make a difference. 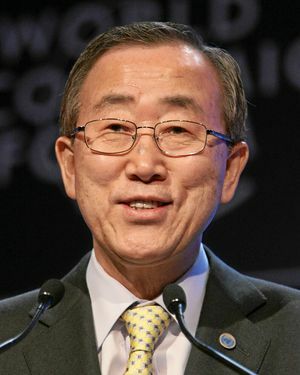 This entry was posted in 10 City Bridge Run, Ban Ki-moon, United Nations and tagged Ban Ki-moon, Millennium Development Goals, United Nations. 24 October was ‘United Nations Day’, commemorating the anniversary when the UN Charter came into effect in 1945. The UN is a large organisation. Massive, in fact. …there is no United Nations… there is an international community that occassionally can be led by the only real power left in the world, and that’s the United States, when it suits our interests, and when we can get others to go along. The Secretariat Building in New York has 38 stories. If you lost ten stories today, it wouldn’t make a bit of difference. Unsurprisingly, he was also highly critical of the Millennium Development Goals. Looking at it from his perspective, this is understandable: it was always a target full of rhetoric and seemingly unachievable, so what was the point of exhausting resources for a measure that was simply beyond reach? The other side of the coin is to take a pragmatic approach that argues that it is more than just a matter of idealistic and wishful thinking, but that an aspirational goal is worth striving towards. We might fall short, but in the process how much can we achieve? 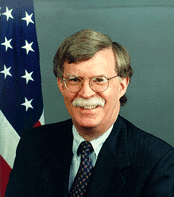 I was responsible for monitoring much of our correspondence with the United Nations when I was in the Army at the time that John Bolton was the US Permanent Representative. Like others, I was amused at his blunt delivery which put a lot of noses out of joint. Years earlier, I recalled how there was in fact a lot of inefficiency in the United Nations that was plainly obvious when I was deployed to East Timor as part of the broader UN force. Now we stand at the end of a moment of truth as it were. The next three years will be telling, and will reflect any momentum generated over the last short period. It is also a window that can be influenced through new ideas, even though a short period. The question would be, how able is the UN really about to respond to such opportunities? Was Bolton right? Is a quarter of the UN just a waste of space? I chose to look at 10.24 as more than just an anniversary. To me it is a personal goal I have set: to run 10 sub-marathons each of 24 km. By doing this, I aim to stimulate a conversation that will take place in Seoul on 24 January 2013 asking how might be use our networks to reduce child mortality. We need people like Bolton. His unyielding cynicism is an important part in generating the creative tension we need to make change happen. But you also need people to push people like Bolton a little harder and show that change is possible. Will you join me and be one of those people? Please join me on this journey. Support me at www.pozible.com/lifebridge to make a difference. This entry was posted in Child mortality, John Bolton, United Nations and tagged John R. Bolton, Millennium Development Goals, United States Ambassador to the United Nations. Legitimacy of G20: Self-appointed for the sake of G172? Last week the leaders of the G20 met in Seoul for the G20 Summit. For many, the ‘Group of 20’ (G20) is a largely self-appointed and barely legitimate body with no authority to assume its current role. 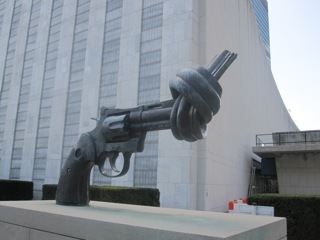 Is this a valid perspective, and what does it mean for the ‘G172’ (the 172 member states of the United Nations)? Over the next few blog posts I will examine the Seoul Summit Declaration in more detail from a development perspective. What decisions did the G20 make, and are there consequences for other countries excluded from the meeting which are unfair or favourable? What did the G20 Summit mean for influencing extreme poverty, and how does this relate to the eight United Nations Millennium Development Goals? 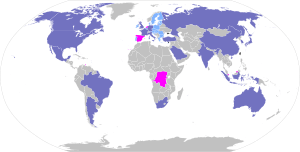 This entry was posted in Development, G20, United Nations and tagged Development, G-20 major economies, United Nations. Did the Government Let Us Down? Last week, Kevin Rudd committed $210 million of Australian money towards the Global Fund to fight HIV/AIDS, TB and Malaria. The global community coughed up a total of $11.7 billion. Let’s not make excuses, or pretend that this is enough money – the reality is that it’s simply not good enough. The Global Fund needed $13 billion to even keep doing what it’s already doing. It needed $17 billion if it was to meet future needs, and $20 billion if it was to adequately help achieve the MDGs and end mother-child transmission of HIV. Australia’s fair share was $500 million – and we didn’t even get half that. I wonder how Australia made that calculation- the $210 dollars? I wonder whether Australia actually have a ‘fair share’ to contribute? When is the point reached where ‘enough money’ is given? Who decides? And if the Australian Government did fall short, who did they let down- us, the United Nations, those who have yet to be infected with HIV/AIDS. TB, Malaria or Measles? Why didn’t the Global Fund just cut out the inevitable disappointment from government and lean on a few ‘rich’ people, as Peter Singer suggests in his book The Life You Can Save? And if we are all surprised at the government giving less than half of what their ‘fare share’ ought to have been, what the hell was going on in New York during the high-level conference about the Millennium Development Goals which was addressed by Kevin Rudd and monitored in New York by Oaktree? Who was to blame for the other $6.3 billion deficit where the Global Fund fell short? Fair shake of the sauce bottle! I think there is more to this than complaining over a ‘fair share’ of money being paid to the Global Fund. What was achieved at the United Nations Conference in September? Is this report from Tom Bland the first signs of blame toward government and the United Nations as we approach 2015? How should we now respond? Giving money to make up the shortfall? This entry was posted in Kevin Rudd, Millennium Development Goals, United Nations and tagged Kevin Rudd, Millennium Development Goals, The Global Fund to Fight AIDS Tuberculosis and Malaria.